Comments: Dewbacks are large, domesticated lizards that are used for transportation on Tatooine. Sandtroopers stationed on the desert planet ride dewbacks, and Tatooine natives use the reptiles to haul goods. Dewbacks easily withstand intense daytime temperatures that cause mechanical equipment to malfunction. Sandtroopers used dewbacks to search for R2-D2 and C-3PO after the droids escaped Imperial forces on the Tantive IV. 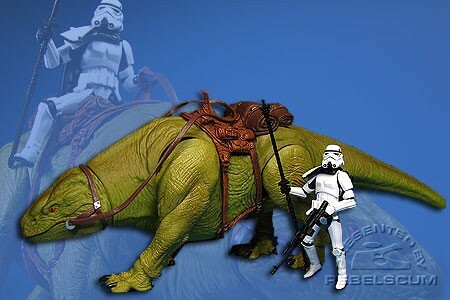 The Dewback is an all-new beast. The Imperial Sandtrooper is an all-new figure. (*) Although this set is based on the scene from A New Hope, the anatomy of the Dewback is based on the creature's appearance in The Phantom Menace, which is now the official look for the beast.